Double Retro Review 90’s Edition. Hey readers it’s been awhile since I last posted, and I’m sorry for the absence. But I am coming back with a little old school Once Upon A Longbox review. While I was putting away some back issues in the fifty cent boxes at my local comic shop I came across two issues that caught my eye from the 90’s. Both of which you can tell what era they are from by looking at the covers. So let’s get to the reviewing shall we? This was definitely a tough read. Not only was it the end to an arc, but it is also very dependant on the reader knowing almost everything that was going on in the X-Men universe at the time. The story follows the X-Men Gold Team going after a cult that follows the beliefs of the dead villain Magneto. But taking on these particular disciples proves to be a much bigger task than they originally anticipate. Like I said before though this is a very tough read if the reader isn’t familiar with the current goings on in the Mutant community of Marvel at the time. 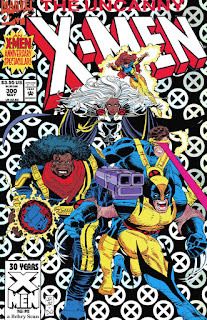 While I was familiar with the members of the X-Men team, I was completely lost when it came to the cult they were tracking. What little I could gather though is that their leader took power after Magneto named him the new head with his dying breath. What nobody else in the group knows is that he killed Magneto so he could take over. As far as Lobdell’s writing is concerned I feel that he had a good grasp of the voices for the characters that he was working with. But that said I wish he would have worked in something that gave a little more context to the greater story that the issue finishes off. I also feel that Lobdell was trying to channel Chris Claremont with the amount of thought bubbles he used sometimes. Then there is the John Romita Jr which was okay, but admittedly I have never been a fan of Romita Jr’s art on bigger characters. He just never seems consistent enough which makes it hard to figure out what character you are looking at sometimes. I apologize to any Romita fans out there but he just isn’t my cup of tea. 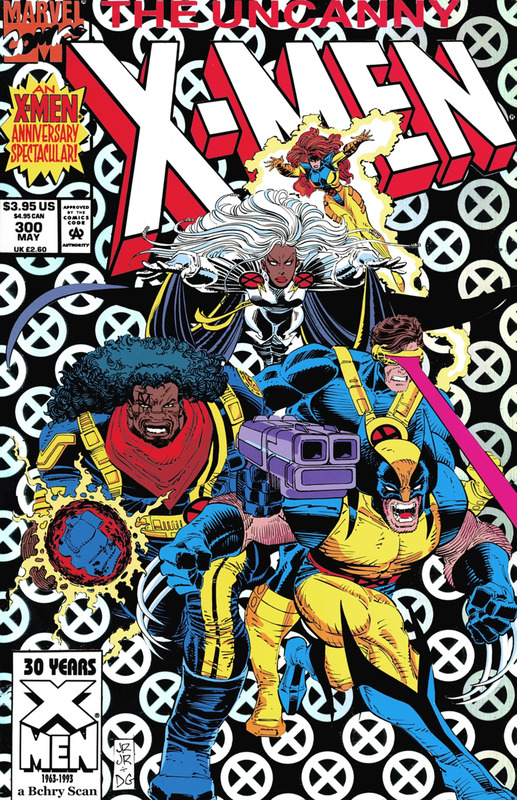 The highlight of this issue to me was getting to see Colossus and Nightcrawler in action, and the previously mentioned cover which was so cheesy on a 90’s level with it’s chromium background that it hit a high level of nostalgia for me. Now this was a fun read from what I consider a great era for Wolverine comics. I feel that Hama and Silvestri put together probably one of the most iconic runs in Wolverine’s solo book history. In this issue Wolverine is traveling around looking for information about his past and trying to confirm memories that have been coming back to him in dreams. This adventure involves Logan riding his motorcycle through a skyscraper in an attempt to reach a S.H.I.E.L.D. hellicarrier that is being secretly fueled above it. Logan needs to reach it so he can get a dossier with everything the government has about his past with the weapon program. Hama has a great ability to balance the emotional and savage sides to the Logan character which makes the story he is telling a lot more compelling. And Hama also seems to find the trick to building the emotion of Logan slowly losing his cool and threatening to go feral at any time. And what could make for a better visual to Hama’s writing than Silvestri’s art? Just looking through this issue reminded me why I love how Silvestri interprets Wolverine in and out of the X-Men costume. On top of that his panels seem to have a flow to them that make the pictures almost move. 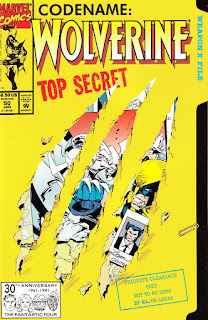 This issue makes me want to go back and read the entire Larry Hama run on Wolverine. And like the other issue I reviewed in this post the cover was a total product of the 90’s comic industry. 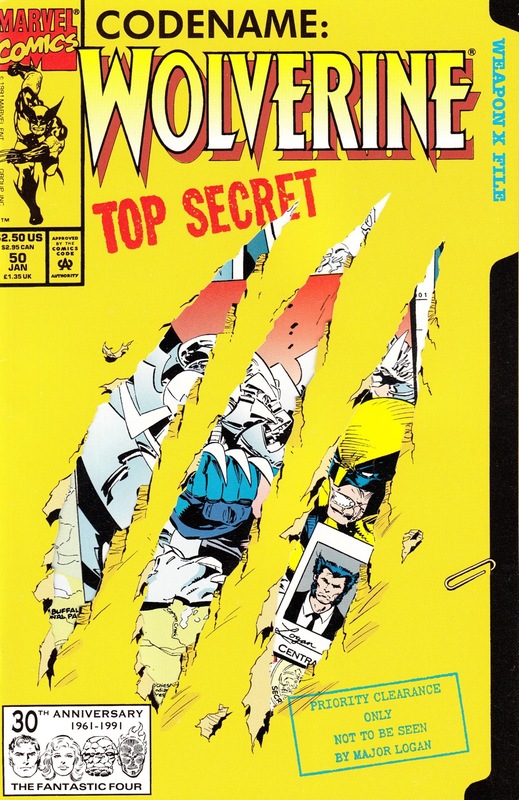 It is designed to look like a dossier that is slashed open by Logan’s claws.